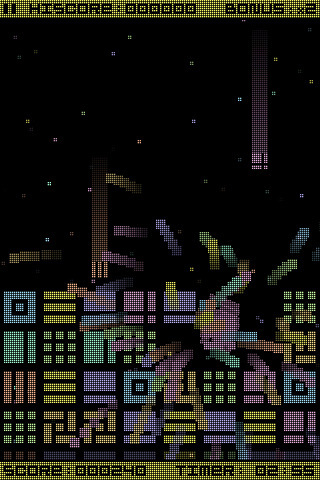 Fans of classic puzzle games will enjoy Binary Square’s Kerplinkus. It is a wonderful addition to a category that fans remember for Tetris, Jewels, and Dr. Mario. The aim of the game is to get the highest score possible before the blocks rise to the top. Kerplinkus is unlike other games because there aren’t any special restrictions for movement and no special blocks. You just swap any 2 blocks (there are 7 different colors/patterns) in any of the 8 columns to remove the blocks before one of the columns reaches the top. Swap any block by touching it and touch another block to finish the swap. If a rising, surface block matches a falling particle, then both blocks are removed. If they don’t match, then the particle becomes a block. Also, if a matching particle and block collide, then all blocks nearby will also be removed. To make the rows of blocks rise faster, simply touch the score bar at the bottom of the screen. Developers of the game really thought of everything. Kerplinkus will auto save if users exit the game for phone calls, text messaging, bathroom breaks (you’ll probably end up taking a couple), or for whatever other reason. Users can also enjoy a retro soundtrack created with the SID chip from Commodore 64, play their own music, or mute the audio completely during play. The difficulty level can also be changed from easy, normal, hard, and insane. The game length can also be changed from endless and timed. Those who want further assistance can e-mail the developers from their iPhone or visit the website. And the best part is that users can submit their scores to online leaderboards and see how they compare locally and globally (top 100 scores). Kerplinkus offers a great gameplay experience. The music and sound effects are good, the features are customizable, and the background reminds me of the Star Wars introduction. Overall, I can’t find anything wrong with the game. It’s a good twist on basic puzzle games of the Tetris, Jewels, and Dr. Mario variety. And Kerplinkus is very, very addictive. Prying yourself away from the game proves very difficult. It has high replay potential and will offer many hours of entertainment. For the low price of $0.99, this is a must-buy for casual puzzle game players. AppSafari review of Kerplinkus was written by Linda Ta on March 19th, 2010 and categorized under App Store, Fun, Games, Puzzler. Page viewed 3184 times, 1 so far today. Need help on using these apps? Please read the Help Page.